People who have not yet celebrated their 18th birthday are often referred to as minor because they are underage. We might refer to the minor prophets as minor because they are under-preached. For several years my only exposure to the book of Habakkuk came from well-meaning people quoting the prophet’s words from 1:13. The text says “You are of purer eyes than to behold evil, and cannot look on wickedness” (NKJV). They cited this verse to emphasize the holiness of God and his inability to look upon sin. Not understanding the error, I began quoting the verse in this way myself.This verse was most often quoted to me concerning Christ on the cross. This verse, it was argued, was proof positive that the Father could not look upon the Son as he took on man’s sin on the cross. There are at least two errors in this claim that ignore the immediate context. First, these are Habakkuk’s words to God concerning his perception of God, not a statement by God reporting his perception of himself. Second, Habakkuk says later in the same verse that God is looking upon sinful people. God is not making a claim about his ability to look upon sin in this verse. Habakkuk is questioning how God can show favor to a people he views as being more wicked than his own. But as I later began to read Habakkuk in its entirety I made an important discovery. I discovered that zeroing in on that verse to focus solely on the Lord’s eyes will cause you to end up missing the Lord’s heart. And missing the Lord’s heart will cause you to miss the Lord’s message. In this post I hope to provide a few pointers to help you preach the Lord’s message from this oft neglected book. Habakkuk presents at least a couple of temptations from which preachers need to flee. So, before we explore pointers on what to do, let’s first address a couple of things not to do. I have briefly explained some of this in my first footnote, but don’t try to use 1:13 as a launch pad to rocket into your own discussion of how God can’t look upon evil or how the Father turned away from the Son at the crucifixion. Regardless of where you stand on the issue, this isn’t what Habakkuk is trying to communicate. The problem is that while you are waxing eloquent on this theological issue, Habakkuk’s real point will go unexplained. The prophet is questioning how God can use a people even more wicked than his own to judge Judah. There is a distinct temptation once you come to 2:4 to jump immediately to the New Testament and start preaching on the doctrine of justification by faith. After all, Paul cited this verse in Romans 1:17 and Galatians 3:11. The author of Hebrews did as well in 10:38. It is certainly permissible and even wise to address New Testament quotations of this verse, but make sure you deal with Habakkuk’s meaning before making the intertestamental leap. Remember, in doing text-driven preaching we want to deal with the substance of the text at hand, what this text is talking about, before addressing what another text is talking about. In text-driven preaching the meaning intended by the biblical author is of paramount importance. What the text is talking about must be the focus of the sermon. 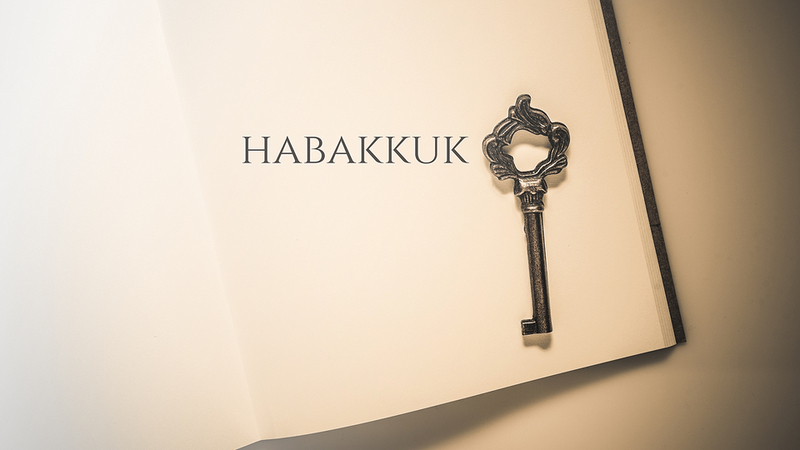 So, what is Habakkuk about? Habakkuk is first about unanswered prayer. Habakkuk’s prayer revolves around two questions. The first question is Why? God, why don’t you do anything about the evil in Judah? Habakkuk has been crying out in prayer, but God appears to do nothing about it (1:2-4). The second question is How? God, how can you use a nation like the Chaldeans to judge us, when they are even more wicked than we are? (1:12-13). Habakkuk is asking how a just God could use an unjust people to fix the justice problem in Judah. Habakkuk is secondly about faith. Habakkuk draws on God’s faithfulness to his people in the past (3:1-15) to confess his own faith in God for the future (3:16-19). The structure of Habakkuk is relatively straightforward. The book can be outlined broadly as follows. (1:1-4) Habakkuk’s First Question: Why don’t you do anything about the evil in Judah? (1:5-11) God’s First Answer: I am! (1:12-2:1) Habakkuk’s Second question: How can you use a people more wicked than us to judge us? (2:2-2:20) God’s Second Answer: I will judge them too. (3:1-19) Habakkuk’s Prayer of Faith: I will rejoice and trust in you. Chapter 2 contains five “Woes” against the prideful Chaldeans. These are “taunt-songs” God says will be sung by their victims, mocking them for the judgments they will receive for their particular transgressions. Patterson artfully summarizes these sins as “Plundering,” (2:6-8) “Plotting,” (2:9-11) “Pillaging,” (2:12-14) “Perverting,” (2:15-17) and being “Polythesitic” (2:18-20).Richard D. Patterson, Nahum, Habakkuk, Zephaniah, Wycliffe Exegetical Commentary (Chicago: Moody Press, 1991)126-27. Each of these merits its own sermon, but they could be preached in a single sermon covering God’s answer from 2:2-2:20. Habakkuk’s prayer song in chapter 3 could also be divided into smaller preaching units, such as 3:1-2, 3:3-15 and 3:16-19 for example, but this is not necessary. If you choose to preach this by dividing the chapter into three sections, make sure you give your people a sense of the chapter as a whole. Chapter 3 is “A prayer of Habakkuk” – not three prayers. The final chapter of this short book is poetry. It has the form of a psalm. A full treatment of the theory and practice of preaching poetry is beyond the scope of this post, but allow me to make one point about preaching psalms. Psalms are inherently emotional. If you preach this genre of Scripture purely as bland propositional prose, you have not preached a text-driven sermon!For a brief defense of pathos in preaching see Adam B. Dooley and Jerry Vines, “Delivering a Text-Driven Sermon,” in Text Driven Preaching: God’s Word at the Heart of Every Sermon, eds. Daniel L. Akin, David L. Allen, and Ned L. Mathews (Nashville: B&H, 2010), 243-67. Habakkuk 3:1 says that the prophet’s prayer is according to “Shigionoth,” which the NASB translators footnote as being “a highly emotional poetic form.” It was emotionally provocative for Habakkuk. It was emotionally provocative for his audience. Strive to recreate that dynamic with your listeners. Consult resources such as Jeffrey Arthurs’ book Preaching with Variety and Steven Smith’s book Recapturing the Voice of God for tips on how to do this well. Preach Habakkuk because it is unique. Most prophets speak to the people. Habakkuk speaks to God. Secondly, preach Habakkuk because, as one of my professors has said, “Most Christians are functional Marcionites.” People largely reject or at the very least ignore the Old Testament. This is especially true of the minor prophets. Thirdly, preach Habakkuk because it deals with the perennial problem of evil. Habakkuk may have written his book in the 7th century B.C., but he is asking some of the same questions the people in the pews are asking today. How can a good God allow evil? Why does God not seem to answer when I cry out to him? Habakkuk teaches us that we can reflect on the Lord’s past faithfulness to trust him with our futures, even when he doesn’t make sense (think the cross!). And brothers…that will preach! 1. ↑ This verse was most often quoted to me concerning Christ on the cross. This verse, it was argued, was proof positive that the Father could not look upon the Son as he took on man’s sin on the cross. There are at least two errors in this claim that ignore the immediate context. First, these are Habakkuk’s words to God concerning his perception of God, not a statement by God reporting his perception of himself. Second, Habakkuk says later in the same verse that God is looking upon sinful people. God is not making a claim about his ability to look upon sin in this verse. Habakkuk is questioning how God can show favor to a people he views as being more wicked than his own. 2. ↑ Richard D. Patterson, Nahum, Habakkuk, Zephaniah, Wycliffe Exegetical Commentary (Chicago: Moody Press, 1991)126-27. 3. ↑ For a brief defense of pathos in preaching see Adam B. Dooley and Jerry Vines, “Delivering a Text-Driven Sermon,” in Text Driven Preaching: God’s Word at the Heart of Every Sermon, eds. Daniel L. Akin, David L. Allen, and Ned L. Mathews (Nashville: B&H, 2010), 243-67.